What’s New? Expanded Clergy Ordination Gift Offerings! While we’ve carried clergy ordination gifts for some time, it seemed to me recently that we ought to add more choices to the category. Over the holidays, we worked on doing just that. You can see the entire collection here. 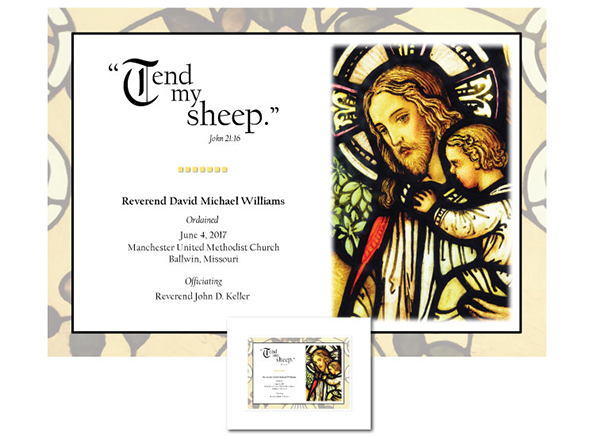 These ordination gifts are double-matted with crisp, white premium quality matboard. 100% cotton and acid free, these mattes will not yellow over time. It’s then mounted on archival backing board and placed in a clear, protective sleeve. It’ll arrive suitable for presentation (many of our customers like to allow recipients the flexibility to choose the perfect frame to match their decor). If you’d prefer to frame it prior to presentation, the outside dimensions are 11×14″ – it’ll fit any frame of that size, regardless of the width of the moulding. By the way, there is a corresponding collection of personalized clergy installation gifts, too.